A shocking, brutal, brilliant episode makes sure everyone knows just how far Westeros' noblest family has fallen. 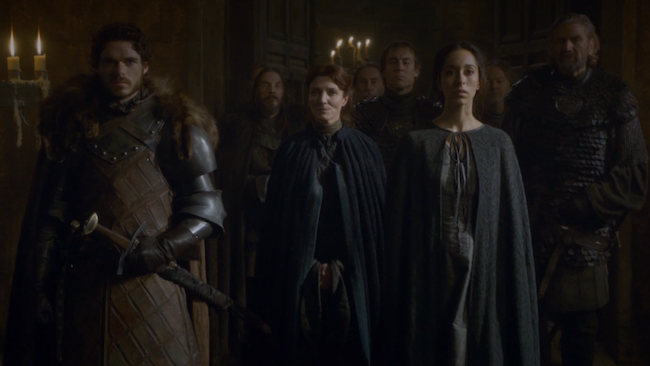 Robb (Richard Madden), Catelyn (Michelle Fairley) and Talisa (Oona Chaplin) prepare for a wedding. You're almost there, and you're afraid you won't make it. The closer you get, the worse the fear gets. "The Rains of Castamere" was an episode full of near misses and narrow escapes. Bran wargs into Summer's mind at the last possible moment and beats back the Wildlings. Jon reveals himself as a member of the Night's Watch and barely escapes from the people he just betrayed. Jorah, Grey Worm and Daario Naharis end one scene facing seemingly impossible odds in Yunkai, and begin the next telling Daenerys that they successfully sacked the city. Jon and Bran pass within yards of each other but never make contact. And Arya comes painfully, achingly close to being reunited with her mother and brother, only to have any hope of happiness torn from her grasp. I had suspected for quite a while that things were going to end badly for Robb. So much of season 3 (and a lot of season 2, really) has been about pushing the King in the North into a corner. His doom was basically sealed once he married Talisa and his mother set Jaime free, and the events of this season have done nothing but back up that hunch, from the loss of the Karstarks to his final, desperate plan to take Casterley Rock from the Lannisters. Robb was hemmed in on all sides, losing supporters because of his marriage to Talisa and the execution of Lord Karstark. On top of that, he was actually happy in his marriage and expecting a child, which is never a good sign in Westeros. The moment I knew Robb and Catelyn were well and truly fucked, though (and I'm going to take a moment here to remind everyone that Catelyn Stark was my number-one pick to die this season, because I, like Melisandre, can see the future in the flames), was the scene quoted at the beginning of this article. As Arya kept staring at the Twins, looking so welcoming in the sunlight with smoke curling out of a chimney, I knew there was no way the younger Stark daughter was ever going to be reunited with her family. And yet, even as I knew that something awful was going to happen, I had a hard time believing that every Stark and Stark-affiliated person at the Twins - with the exception of Arya, who I'll get to in a minute, and the possible exceptions of Brynden the Blackfish and Edmure Tully, whose fates are currently up in the air - is now dead. Robb, Catelyn, Talisa and her unborn child, even Robb's wolf Grey Wind, were wiped out in a massacre orchestrated by the Freys and Boltons, and probably also the Lannisters. It's hard to accept that they're all gone, not just because the scene was so shocking and emotionally devastating, but because this basically means the Lannisters have won. Yes, Stannis Baratheon and Balon Grey joy are still theoretically revolting, but neither of them has much of an army to speak of. With Dany busy freeing slaves across the Narrow Sea and Mance Rayder trying to get past the Night's Watch, there is no one left to oppose Tywin and Joffrey. The Red Wedding was more than a horrific tragedy for the Stark family; it was an absolute game-changer that took away any hope for a Westeros not dominated by the Lannisters. The geopolitical consequences of the massacre, however, took a backseat to the personal consequences in "The Rains of Castamere," as they should have. The scene was beautifully staged, taking advantage of the episode's many narrow escapes to wring every bit of tension out of the lead-up to the bloodbath. The moment of truth happens fast, taking only a couple of minutes, but every new horror feels earned because the episode, the season and, let's be honest, the series, have been building to this moment. Every performer involved gives it their all - Richard Madden's final, desperate "Mother" is gutting - but the scene belonged to Michelle Fairley. She does a beautiful job showing Catelyn's slowly dawning realization that something is wrong as the doors of the hall are closed and the band segues from "The Bear and the Maiden Fair" to "The Rains of Castamere." Her voice, haggard and pained as she tries desperately to bargain for Robb's life, animalistic as she cuts the throat of Walder Frey's young wife after watching her son die, is like a punch to the gut. And Frey's reaction to the death of his wife - a tossed-off "I'll find another" - establishes the man as yet another incurably evil inhabitant of Westeros, right up there with Joffrey and Theon's as-yet unnamed torturer. The single most awful moment of the episode, however, comes before Robb and Catelyn die. After Talisa has been stabbed repeatedly, in the gut, a definitive end not only to her life but to the baby she was going to call Ned Stark - which is a bad omen if there ever was one - Robb and Catelyn are shot through by crossbow bolts, but not yet dead. The massacre has not yet spread out of the hall, the men outside are feasting, and the only visible sign that something is wrong is Grey Wind howling. Arya has run toward the hall and, within sight of the place where her mother and brother are dying, allows herself to smile at the thought of finally seeing her family. Then Frey and Bolton soldiers exit and start killing Stark men, shooting Grey Wind before Arya can release him. Maisie Williams is phenomenal as always, and Arya's slow, stunned recognition of the scene unfolding in front of her is heartbreaking. Other stuff happened in "The Rains of Castamere," but it's hard for Bran's assumption of his warg powers or Dany's sack of Yunkai to make much of an impact in the face of the Red Wedding. I assume next week will be spent picking up the pieces and acquainting us with the new power structure of the Seven Kingdoms. For now, we can take a moment to remember the Starks, and their ultimately wrong-headed belief that duty, honor and playing by the rules would help them succeed. The world of Game of Thrones is a brutal place, with very little room for those with purer motivations. As Sansa Stark said in last year's penultimate episode, "Blackwater," "The worst ones always live." I like this art very much.